These "special issue" American Eagle Silver Uncirculated Coins are struck on specially burnished blanks and are quite possibly the most popular and sought after U.S. Mint issue of each year. This coin offers buyers a new highly collectible version of the popular American Eagle Silver Bullion Coin and features a finish similar to its bullion coin counterpart. However, unlike the regular bullion issue, this coin also bears the prized "W" mintmark reflecting its striking at the United States Mint at West Point. The obverse design features Adolph A. Weinman's stunning Walking Liberty design dating back to 1916, with an ever hopeful Liberty striding confidently toward the sunrise, draped in the strength of the Stars and Stripes carrying in her arms branches of laurel and oak to symbolize both civil and military glory. The reverse design, by United States Mint sculptor John Mercanti, features a striking heraldic eagle with shield, and olive branch in the right talon and arrows in the left. The 2008-W American Eagle Silver Uncirculated Coin is encapsulated in plastic, placed in a protective outer box, and accompanied by a custom-designed Certificate of Authenticity. IMPORTANT NOTE: These are NOT the rare 2008 with reverse of 2007 error coins (valued around $500 per coin) as shown in the photo. This image is a stock photo from the U.S. Mint which ironically shows the 2007 reverse design. 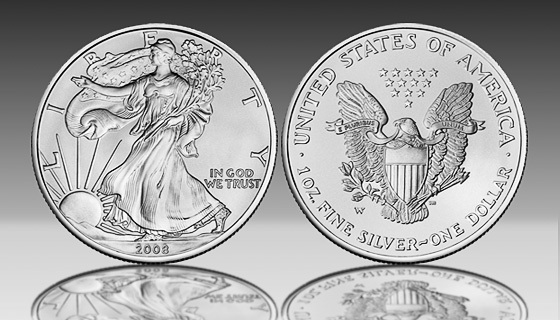 Copyright © 2000-2010, Silver Eagle Coin Company. All rights reserved.